"Pocket billiards" redirects here. For other uses, see Pocket billiards (disambiguation). Dutch pool player Niels Feijen at the 2008 European Pool Championship. Pool is a classification of cue sports played on a table with six pockets along the rails, into which balls are deposited. Each specific pool game has its own name; some of the better-known include eight-ball, eightball pool and its variant blackball, nine-ball, ten-ball, seven-ball, straight pool, one-pocket, and bank pool. The generic term pocket billiards is sometimes also used, and favored by some pool-industry bodies, but is technically a broader classification, including games such as snooker, Russian pyramid, and kaisa, which are not referred to as pool games. There are also hybrid games combining aspects of both pool and carom billiards, such as American four-ball billiards, bottle pool, cowboy pool, and English billiards. Historic print depicting Michael Phelan's billiard saloon in New York City, January 1, 1859. The etymology of "pool" is uncertain. The Oxford English Dictionary speculates that "pool" and other games with collective stakes is derived from the French poule (literally translated "hen"), in which the poule is the collected prize; alternatively it could derive from the verb to pool in the sense of combining objects or stakes. The oldest use of the word "pool" to describe a billiards-like game was made in 1797 in a Virginia newspaper. The OED defines it as generally "any of various types of billiards for two or more players" but goes on to note that the first specific meaning of "a game in which each player uses a cue ball of a distinctive colour to pocket the balls of the other player(s) in a certain order, the winner taking all the stakes submitted at the start of the contest" is now obsolete, and its other specific definitions are all for games that originate in the United States. 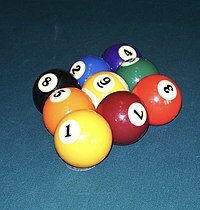 In the United States, although the original "pool" game, skittle pool, was played on a pocketless carom billiards table, the term later stuck to all new games of pocket billiards as the sport gained in popularity,:186 and so outside the cue sports industry, which has long favored the more formal term pocket billiards, the common name for the sport has remained pool. The OxfordDictionaries.com definition no longer even provides the obsolete meaning found in the print edition, and refers only to the typical game "using two sets [each] of seven coloured and numbered balls ... with one black ball and a white cue ball" on a table with pockets. 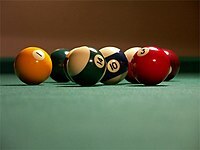 With the exception of one-pocket, games typically called "pool" today are descended from two English games imported to the United States at the beginning of the 19th century. The first was English billiards which became American four-ball billiards, essentially the same game but with an extra red object ball to increase scoring opportunities. It was the most popular billiards game in the mid-19th century until dethroned by the carom game straight rail. American four-ball tournaments tried switching to carom tables in the 1870s but this did not save it from being doomed to obscurity, the last professional tournament was held in 1876.:5-6 Cowboy pool is a surviving member of this group of games. Pool is played on a six pocket table. Modern pool tables generally range in size from 3.5 feet (1.07 m) by 7 feet (2.13 m), to 4.5 feet (1.37 m) by 9 feet (2.74 m). The balls range from 2.25 inches (57.15 mm) in diameter to 2.375 inches (60.33 mm) in diameter. Under the WPA/BCA (see below) equipment specifications, the weight may be from 5.5 to 6 oz. (156–170 g) with a diameter of 2.25 in. (57.15 mm), plus or minus 0.005 in. (0.127 mm). Modern coin-operated pool tables generally use one of three methods to distinguish and return the cue ball to the front of the table while the numbered balls return to an inaccessible receptacle until paid for again: the cue ball is larger and heavier than the other balls, or denser and heavier, or has a magnetic core. Modern cue sticks are generally 58.5 inches (148.6 cm) long for pool while cues prior to 1980 were designed for straight pool and had an average length of 57.5 inches (146.1 cm). By comparison, carom billiards cues are generally shorter with larger tips, and snooker cues longer with smaller tips. Eight-ball rack: Full rack of fifteen balls, ready for the break shot. Correct set up for blackball. In the United States, the most commonly played game is eight-ball. 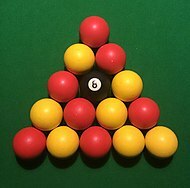 The goal of eight-ball, which is played with a full rack of fifteen balls and the cue ball, is to claim a suit (commonly stripes or solids in the US, and reds or yellows in the UK), pocket all of them, then legally pocket the 8 ball, while denying one's opponent opportunities to do the same with their suit, and without sinking the 8 ball early by accident. In the United Kingdom the game is commonly played in pubs, and it is competitively played in leagues on both sides of the Atlantic. The most prestigious tournaments including the World Open are sponsored and sanctioned by the International Pool Tour. Rules vary widely from place to place (and between continents to such an extent that British-style eight-ball pool/blackball is properly regarded as a separate game in its own right). Pool halls in North America are increasingly settling upon the World Pool-Billiard Association International Standardized Rules. But tavern eight-ball (also known as "bar pool"), typically played on smaller, coin-operated tables and in a "winner keeps the table" manner, can differ significantly even between two venues in the same city. The growth of local, regional and national amateur leagues may alleviate this confusion eventually. One of many correct nine-ball racks: the 1 ball at the apex centered over the foot spot, the 9 ball at center, the other balls placed randomly, and all balls touching. Nine-ball uses only the 1 through 9 balls and cue ball. It is a rotation game: The player at the table must make legal contact with the lowest numbered ball on the table or a foul is called. The game is won by legally pocketing the nine ball. Nine-ball is the predominant professional game, though as of 2006–2008 there have been some suggestions that this may change, in favor of ten-ball. [clarification needed] There are many local and regional tours and tournaments that are contested with nine-ball. The World Pool-Billiard Association (WPA) and its American affiliate, the Billiard Congress of America (BCA), publish the World Standardized Rules. The European professional circuit has instituted rules changes to make it more difficult to achieve a legal break shot. The largest nine-ball tournaments are the independent US Open Nine-ball Championship and the WPA World Nine-ball Championship for men and women. Male professionals have a rather fragmented schedule of professional nine-ball tournaments. The United States Professional Poolplayers Association (UPA) has been the most dominant association of the 1990s and 2000s. A hotly contested event is the annual Mosconi Cup, which pits invitational European and U.S. teams against each other in one-on-one and scotch doubles nine-ball matches over a period of several days. The Mosconi Cup games are played under the more stringent European rules, as of 2007. A variant using only three balls, generally played such that the player at turn continues shooting until all the balls are pocketed, and the player to do so in the fewest shots wins. The game can be played by two or more players. Dispenses with some fouls common to both nine- and eight-ball. One-pocket is a strategic game for two players. Each player is assigned one of the corner pockets on the table. This is the only pocket into which he can legally pocket balls. The first player to pocket the majority of the balls (8) in his pocket wins the game. The game requires far more defensive strategy than offensive strategy, much unlike eight-ball, nine-ball, or straight pool. Most times, accomplished players choose to position balls near their pocket instead of trying to actually pocket them. This allows them to control the game by forcing their opponent to be on defense instead of taking a low percentage shot that could result in a loss of game. These low percentage shots are known as "flyers" by one-pocket aficionados. Bank pool can be played with a full rack (can be a long game), but is more typically played with nine balls (frequently called "nine-ball bank"). The balls are racked in nine-ball formation, but in no particular order. The object of the game is simple: to be the first player to bank five balls in any order (eight balls when played with a full rack). Penalties and fouls are similar to one pocket in that the player committing the foul must spot a ball for each foul. This must be done before the incoming player shoots. As a competitive sport, pool is governed internationally by the World Pool-Billiard Association (WPA), which has multi-national, regional affiliates comprising the All Africa Pool Association (AAPA), Asian Pocket Billiard Union (APBU, including the Middle East), Billiard Congress of America (BCA, Canada and the US), Confederación Panamericana de Billar (CPB, Latin America and Caribbean), European Pocket Billiard Federation (EPBF, including Russia and the Near East), and Oceania Pocket Billiard Association (OPBA, Australia, New Zealand, Pacific islands). The WPA represents pool in the World Confederation of Billiards Sports, which in turn represents all forms of cue sports (including carom billiards and snooker) in the International Olympic Committee. ^ "The Official Website for the Governing Body of Pool". WPA-Pool.com. Sydney, Australia: World Pool-Billiard Association (WPA). 2011. banner, copyright notice, etc. Retrieved November 4, 2011. "Pool billiards" is sometimes hyphenated and/or spelled with a singular "billiard". The WPA itself uses "pool-billiard" in its logo but "pool-billiards" in its legal notices. The organization compounds the words to result in an acronym of "WPA", "WPBA" having already been taken by the Women's Professional Billiards Association. Normal English grammar would not hyphenate here, and the term is actually a Germanism. ^ Game Rules for... Six-pocket. Amityville, New York: U.S. Billiards, Inc. c. 1970. A general rules booklet on pool games in general, including eight-ball, nine-ball and several others. ^ "entry for Pool, n.3". Oxford English Dictionary. Retrieved 15 February 2018. ^ a b c d Shamos, Mike (1999). The New Illustrated Encyclopedia of Billiards. New York: Lyons Press. ISBN 1-55821-797-5. ^ "pool, 2, noun, 2". OxfordDictionaries.com. "British and World English". Oxford University Press. 2016. Retrieved July 15, 2016. ^ a b Shamos, Mike (1994). Pool. New York City: Friedman Fairfax. ^ "World Rules of Carom Carom Billiard" (PDF). UMB.org. Sint-Martens-Latem, Belgium: Union Mondiale de Billard. January 1, 1989. Chapter II ("Equipment"), Article 12 ("Balls, Chalk"), Section 2. Archived from the original (PDF) on September 28, 2007. Retrieved March 5, 2007. Officially but somewhat poorly translated version, from the French original. ^ "WPA Tournament Table & Equipment Specifications" Archived 2011-02-18 at the Wayback Machine, World Pool-Billiard Association, November 2001. ^ BCA Rules Committee (2004). Billiards: The Official Rules and Records Book. Colorado Springs, Colorado: Billiards Congress of America. p. 5. ISBN 978-1-878493-14-9. ^ a b Varner, Nick (February 2008). "Killing Me Softly? The Outbreak of the Soft Break Threatens the Game of 9-ball". Billiards Digest. 30 (3). Chicago,: Luby Publishing. pp. 4–35. ISSN 0164-761X. ^ a b Panozzo, Mike (February 2008). "Long Live the Cup!". Billiards Digest. 30 (3). Chicago,: Luby Publishing. pp. 34–35. ISSN 0164-761X. Wikimedia Commons has media related to Pool (cue sports). Shamos, Mike (1999). The New Illustrated Encyclopedia of Billiards. New York: Lyons Press. ISBN 1-55821-797-5.